DA Form 7383-R - also known as the "Individual Linguist Record (ilr) (lra)" - is a Military form issued and used by the United States Department of the Army. The form - often mistakenly referred to as the DD form 7383-R - was last revised on April 1, 1997. Download an up-to-date fillable PDF version of the DA 7383-R below or request a copy through the chain of command. U.S. Code, Title 37, Section 101 and following. 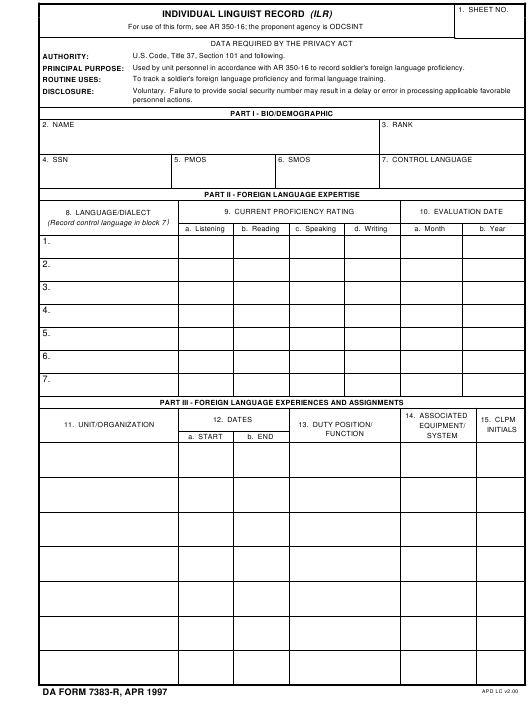 Used by unit personnel in accordance with AR 350-16 to record soldier's foreign language proficiency. To track a soldier's foreign language proficiency and formal language training.